Schuhplattlers agreed to make an effort to go again this year. groups and people who are interested in German culture and heritage. 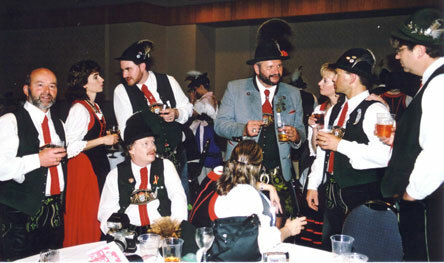 Schuhplattlers, all dressed in authentic costumes (Tracht). dance, and was noted at the event for its distinct style and choreography. are masterworks in embroidery; at 5′ by 5′ in size they are massive. our group has affirmed its plans to join the Gauverband Nordamerika. connections with fellow Trachten groups and made new friends.